Tales from the great wilderness of our house in West Ottawa. To get the baseboards installed, we needed a nail gun, and so we proceeded to a Canadian Tire store to get it. Usually, I avoid shopping for at least a whole month after Christmas (being all "shopped out"), so this was the first time I got to see the Canadian Tire parking lot in early January. I could not believe the number of cut Christmas trees still in the lot, that never got sold. It's so sad that all those trees have been cut, and are now pretty much useless (well, except maybe for mulch or something). Christmas trees always present me with a dilemma. We always had fresh cut Christmas trees at home, as big as we could possibly fit into the house! So I always associate the smell of the sap and the evergreen with the Christmas season, and find it hard to imagine celebrating the season without a fresh tree standing in the corner. On the other hand, I have some concerns about buying live Christmas tree, mostly because of the environmental impact (big waste, and poor forestry practices associated with the business). This year we cut a tree that was on its way out anyway, so that made the decision easy. We definitely have a bunch of adequate Christmas-like trees in the back yard, but I'd rather see them grow and multiply rather than cut them down. I would love to have more trees growing back there, though so far all our efforts to plant new ones have been thwarted (mostly by the animal population deciding to munch on the tasty new greens...). Living on the outskirts of Ottawa with my DH, with Bunny Rabbit. 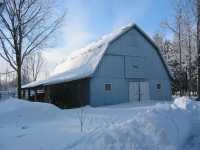 In the picture you can see the big blue barn on our property. We enjoy living out in the "boonies" with the neighbour's horses, and the wildlife.